One of our games portal is sure to delight you and more if you are a fan of fashion. This beautiful girl will have a party on the beach with her surfing friends, she needs you to help her select a beautiful outfit for the occasion, make up and decorate her surfboard. Let's help this fun girl to dress her for her party in the waves. This fun game can be made from any device: Smartphone, Tablet and PC. 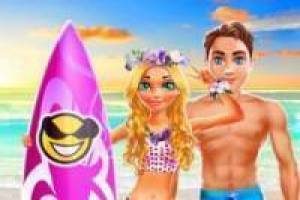 Enjoy the game Dress up the surf girl, it's free, it's one of our girls games we've selected.